Guys, I am compelled to tell you about some new cases I just picked up for my iPhone 5 that I am in LOVE with. I had picked up a clear backed/white silicone edged case at the Verizon store with my phone because they discounted the charger/case bundle but I wasn't happy with how quickly the white silicone became dirty (next day). 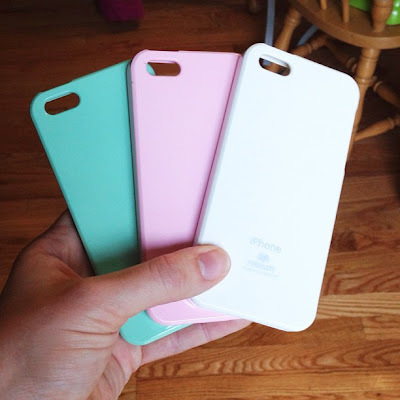 I had a gift card to Amazon so I took a peek and found the most perfect phone cases! These are Caseology Slim Fit cases, and I love that they are flexible like a silicone case, but smooth and feel like a hard case when they're on the phone. But they protect like a softer case would, cushioning the phone if it falls. They're highly rated (4.6/5 stars out of nearly 1200 reviews) and at a super great price - just $8.97 each. I couldn't decide on which of the dozen colors I wanted so I ordered three - white, pink, and turquoise mint (which is more green than the photo on Amazon but still a super pretty color). I've used the white and pink on the phone already and I LOVE them. They have a bit of a shimmer inside the color too which is really pretty. They feel so smooth and fit like a glove. They also don't add a lot of bulk to the phone. I wish the three could mate and make a chevron baby! The colors are so cute together!